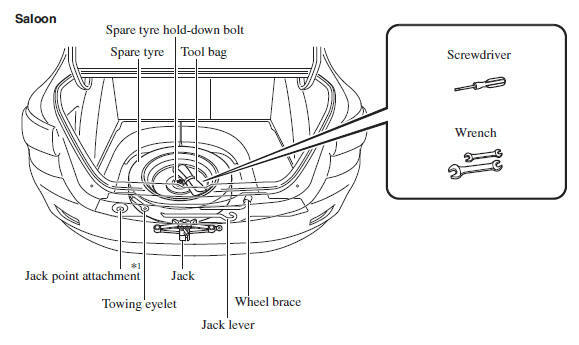 Spare tyre and tools are stored in the locations illustrated in the diagram. *1 The jack point attachment can be used by vehicle repair shops and road assistance services. Consult an Authorised Mazda Repairer for details. Your vehicle may or may not be equipped with a jack. For details, consult an Authorised Mazda Dealer. 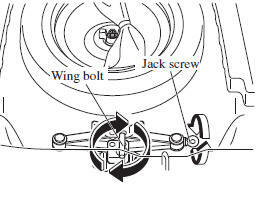 Turn the wing bolt and jack screw anticlockwise. Lift the luggage compartment mat. 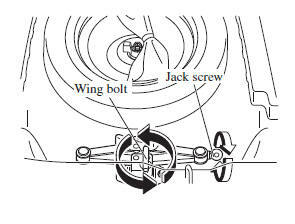 Insert the wing bolt into the jack with the jack screw pointing to the right (Saloon) or down (Hatchback) and turn the wing bolt clockwise to temporarily tighten it. Turn the jack screw in the direction shown in the fi gure. Turn the wing bolt completely to secure the jack. If the jack is not completely secured, it could rattle while driving. Make sure the jack screw is suffi ciently tightened. 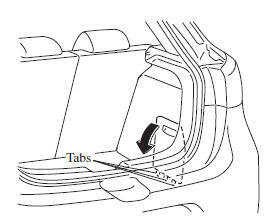 Return the boot board to its original position (Saloon), or insert the cover tabs and install the cover (Hatchback). Verify that the cover is securely installed. Perform the removal procedure in reverse. Make sure the moving parts are kept free from dirt or rust. Make sure the screw thread is adequately lubricated. Your Mazda has a temporary spare tyre. The temporary spare tyre is lighter and smaller than a conventional tyre, and is designed only for emergency use and should be used only for VERY short periods. Temporary spare tyres should NEVER be used for long drives or extended periods. 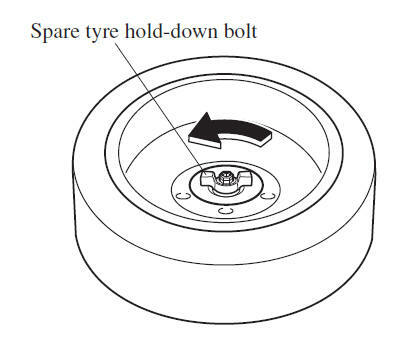 Do not install the temporary spare tyre on the front wheels (driving wheels): Driving with the temporary spare tyre on one of the front driving wheels is dangerous. Handling will be affected. You could lose control of the vehicle, especially on ice or snow bound roads, and have an accident. Move a regular tyre to the front wheel and install the temporary spare tyre to the rear. When using the temporary spare tyre, driving stability may decrease compared to when using only the conventional tyre. Drive carefully. Do not exceed 80 km/h (50 mph). Avoid driving over obstacles. Also, do not drive through an automatic car wash. This tyre's diameter is smaller than a conventional tyre, so the ground clearance is reduced about 20 mm (0.8 in). Do not use a tyre chain on this tyre because it will not fi t properly. Do not use your temporary spare tyre on any other vehicle, it has been designed only for your Mazda. Use only one temporary spare tyre on your vehicle at the same time. Lift the boot/luggage compartment mat. Turn the spare tyre hold-down bolt anticlockwise. Store the spare tyre in the reverse order of removal. 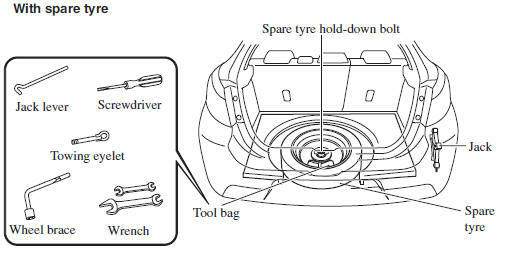 After storing, verify that the spare tyre is stored securely.